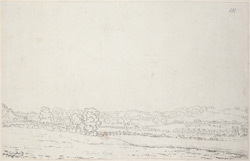 An outline view in ink of the racecourse at Durham. Races had been held here since the 17th century at least. Meets were very popular with people throughout the North East - on 14 April 1873 a crowd of 80,000 people attended, bringing the city to a standstill. This led to a desperate shortage of accommodation, so many of the townsfolk offered their homes as lodgings for the night. The grounds have not been used as a racecourse for most of the 20th century.